Today: A party drink that is begging -- nay, requiring -- to be made ahead of time. Which means less work for you, and more sangria for everyone. 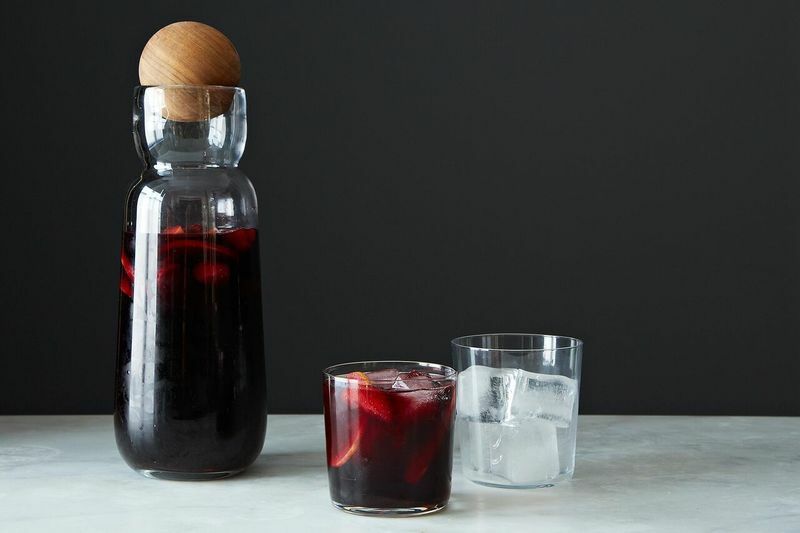 You shouldn't have to suffer one more summer night without sangria. It's inherently meant for warm nights, for patios, for when you're somewhere much less glamorous but you're looking to feel festive. This is the lazy stock of alcoholic beverages: start with a base of wine, toss in the liquid equivalent of odds and ends, and let everything macerate and juice and mingle. You wait, and when you're done waiting, you're left with something infinitely better than the sum of its parts. And hopefully a pleasant buzz. Here's how it's done. 1. Decide what citrus and other fruit you'd like to make friends with your wine, and slice it up. 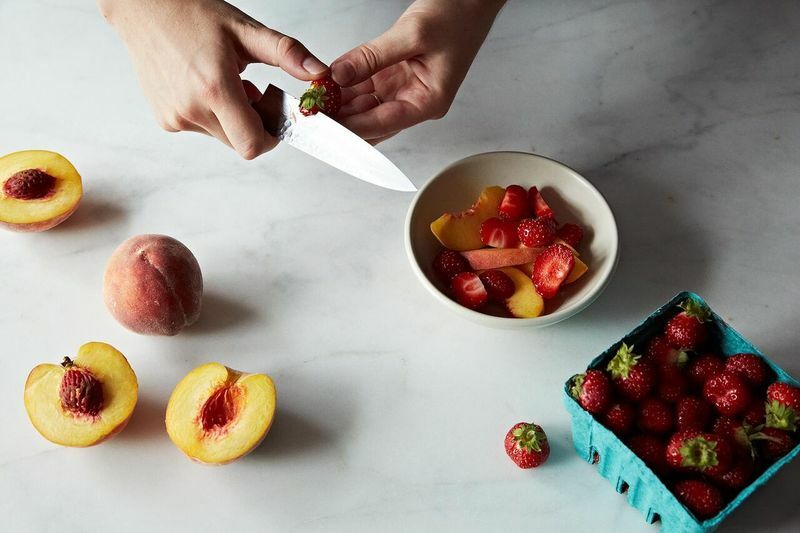 Everything from stone fruit to berries to lemons to tropical fruit is fair game. No one is going to tell you you've added too much fruit -- or too little -- but a general rule of thumb is 2 cups of sliced fruit per bottle of wine. 2. Enter the alcohol. First choose the wine -- you can use red, white, or rosé, but keep in mind that you'll want to use more delicately-flavored fruit with lighter wines. Red wine can handle almost anything you throw at it. To the wine, add your fruit, and then spike it with a half a cup of something stronger. For red wine, we like equal parts brandy and Triple sec. You could add a spoonful of sugar at this juncture. You could also not. 3. Chill for as long as you can wait -- sangria will last for a few days in the fridge -- or at least a few hours. Now fill a glass with ice and pour, making sure to nestle a little wine-soaked fruit into each glass, and top with a bit of sparkling water. You deserve it. Will this carafe be for sale again? I had a housemate who was from Spain and she said that the secret ingredient to Sangria is cinnamon. Have you ever heard of that? Wow! Judging from the comments, I'm glad I jumped on that carafe while it was in stock. Haven't used it yet but it's washed and ready to go. It really is cute. Ready for an end of summer/early fall get-together on my deck. We're working on it! Sorry for the inconvenience. Can you provide a direct link to the carafe? I would like to order it. please can you get the carafe back in stock? 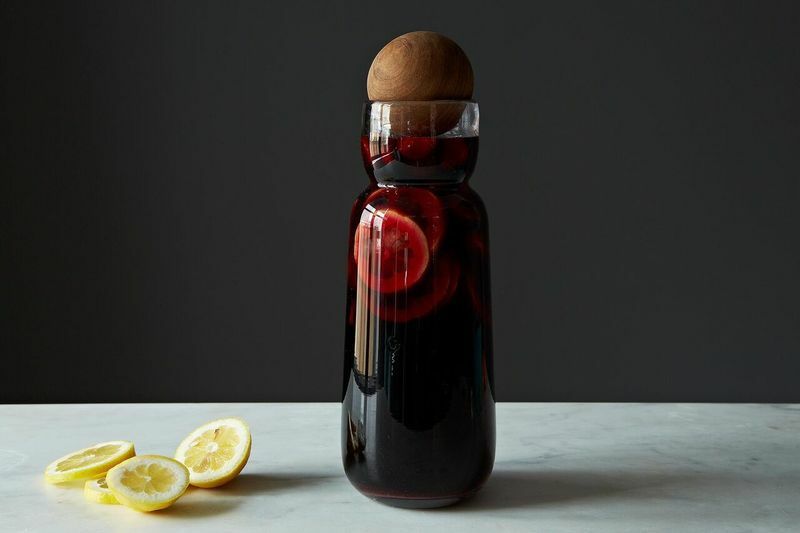 love the recipes, but would really love to serve it in that carafe! Ditto on the carafe!!! LOVE IT! How can we get one? ...what does one do with fruit one may ask, "Sangria-oh yeah!" Thank you for the Sangria recipe! The best one I've seen! Love the carafe! Just ordered one! What stronger 'something' do you suggest for white wine? For white I'll usually leave the brandy out and just go with Triple sec, but I love playing around with different liqueurs too, like St. Germain. I love adding honey liquor (I actually soak the fruit in it overnight) to a pinot grigio sangria! 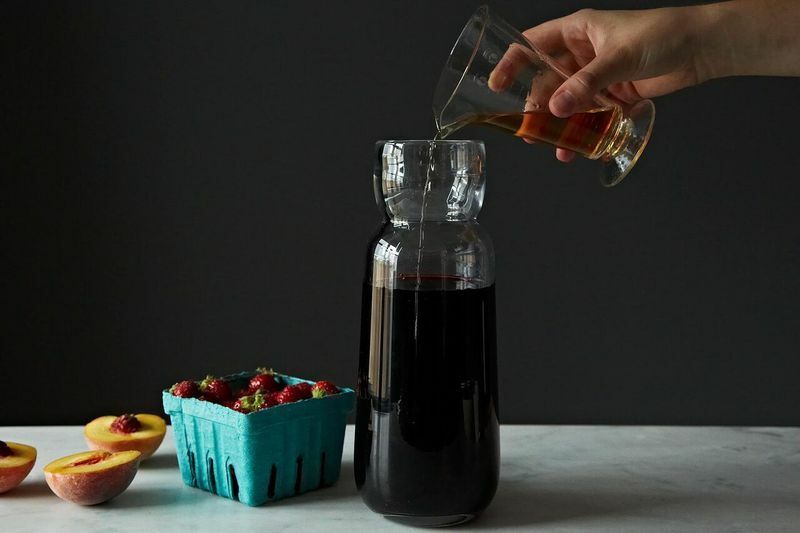 I say...folks - sangria is not a problem for me to make or drink; BUT does Provisions have that carafe for sale? It's your lucky day! Indeed we do.